Locals and visitors alike flock to Warpigs, a hip brew pub in the Meatpacking District, for pints of their house-brewed beer and other offerings from some of Copenhagen’s best breweries. Grab a spot on the patio and order a six-beer flight, a sampling of the American-Danish-style draught beers from the bar’s 22 rotating taps. And don’t miss the daily selection of Texan BBQ, (think smoked brisket, pork shoulder and spare ribs) paired with your choice of four signature sauces. Ex-Noma chef Rosio Sanchez serves the city’s most authentic tacos at her two outdoor taquerias, located in Kødbyen and Torvehallerne. Grab a spot at a picnic table and dig into the El Paul, crispy fish skin, gooseberry salsa, onion, cilantro and avocado. Or stick with the classic pork carnitas: braised pork belly, pasilla salsa, onion and cilantro. This East London-inspired beer and gin bar near Nyhavn hosts a daily happy hour that offers many two-for-one drink specials. Grab a stool at the bar or sink into one of the vintage-leather armchairs and order the Black & Yellow: Bulldog Gin with Thomas Henry tonic, lemon and licorice root, the bar’s signature garnish. Or let the staff happily guide you through the options. A favourite breakfast spot among locals, Grød is a porridge café that serves a seemingly endless combination of toppings and flavours, with a focus on seasonal and local fruits. Create your own concoction with toppings like apple compote, cocoa nibs, freeze-dried raspberries and caramel sauce. The restaurant is open from 7:30 a.m. to 9 p.m., so if you don't want to wait in line, head there for a snack later in the afternoon when it’s less busy. Reservations are a must at Relæ, named one of the World’s 50 Best Restaurants and one of Copenhagen’s finest restaurants. Choose a four- or nine-course menu featuring items like Havervadgard lamb with shrimp and dill or romaine lettuce served with egg yolk and netties. The restaurant is expensive, so save it for a special occasion. This relaxed spot in the Meatpacking District serves up some of the most delicious fish and shellfish in Copenhagen. The menu varies depending on the fresh catch. Past favourites include seared trout with Brussels sprouts and oyster mushrooms and haddock with Jerusalem artichokes and fermented pear pearl barley. Located in Hotel SP34, Väkst is a greenhouse restaurant in the Latin Quarter that offers farm-to-table cuisine. Chef Jonas Christensen’s menu is informal and mostly vegetarian with a focus on eco-friendly ingredients; think salt-baked kohlrabi with burnt hazelnut purée, organic buttermilk and white asparagus served with butterhead lettuce, fresh cheese and roasted yeast oil. Hanging potted plants, vines and natural light create a feeling of dining in a secret garden. This upscale version of Copenhagen Street Food is a bustling covered market chock full of artisanal food and drink stalls. Make like a local and head to Hallernes for smørrebrød piled high with herring and egg or roast beef. For a caffeine fix, go to Coffee Collective, and stock up on pale ales from Mikkeller & Friends. Islands Brygge is a trendy neighbourhood next to the harbour and a popular spot for locals to sunbathe and swim in the harbour sea baths. With five baths in total (two reserved for children), it’s a unique city experience. Don’t miss a post-swim ice cream cone at Bryggen 11, which features unique flavours like licorice and white chocolate with lemon. Take a 20-minute train ride from Copenhagen Airport to Malmö Centralstation in Sweden. When you arrive, make like a Swede and fika at Söderberg & Sara, a casual café that offers filter coffee made using beans roasted at their Österlen location and an array of freshly baked pastries. (Don’t miss the cinnamon buns.) Later brace yourself for a refreshing dip in the Ribersborgs Kallbadhus (public sea baths), but leave your swimsuit at home; it’s skinny-dipping only. Spend an afternoon strolling through Nørrebro, Copenhagen’s hippest neighbourhood, teeming with art galleries, wine bars, restaurants and more. Then head to Jægersborggade and check out Superkilen, a public park that boasts a Moroccan fountain and Japanese sculpture, and CMYK kld, a gallery/store that sells posters and illustrations by Danish artists. For souvenirs, design lovers should head to Hay House, the flagship store of Scandinavian interiors brand Hay. Spread across the second and third floors of an apartment on Østergade, the boutique sells everything from rugs and designer pillows to geometric-shaped trays and vases. Celebrating its neighbour’s best style export, Copenhagen’s Acne Archive is a must-see destination for Swedish fashion fans. The sleek outlet in Nørrebro stocks collections from previous seasons at a fraction of the price. Housed in a historic building dating back to 1882, Kong Arthur is conveniently located between Copenhagen’s food market, Torvehallerne, and the hip Nørrebro neighbourhood. The 155-room property houses one of the city’s most luxurious spas and three in-house dining choices: Italian fare at La Rocca; Spanish tapas at Pintxos; and Japanese-inspired cuisine at Sticks’n’Sushi. Most of the rooms in this luxury hotel located on the grounds of Tivoli Gardens theme park have fireplaces or large balconies overlooking Tivoli Gardens, and they all come equipped with Bang & Olufsen tech. Guests have access to the hotel’s personal shopper, butler service and dog walkers (for those travelling with a pooch). Book suite 12 for some of the prettiest views of the theme park. This waterfront hotel offers modern guest rooms, complete with impressive views of the skyline and all-white bathrooms stocked with Face Stockholm toiletries. Spacious family rooms are available for those travelling with little ones – children under 13 stay for free – and kids will love the hotel’s colourful playroom with its PlayStation, toys and craft supplies. Located in the trendy Latin Quarter, this boutique hotel offers spacious guest rooms with free Wi-Fi and contemporary Danish furnishings. For a truly special stay, book the Star Suite, featuring a 678-square-foot penthouse terrace that overlooks downtown Copenhagen. This hotel is great for business travellers, thanks to its location – it’s 10 minutes from the airport and 15 minutes from downtown – and its amenities, such as an airport shuttle, gym and its own convention centre. For downtown trips, catch a bus outside the hotel door or walk to nearby Bella Centre station to catch one of Copenhagen’s modern driverless trains. After a day of meetings, unwind in the hotel spa, complete with hot tubs, massaging showers, saunas and steam baths. This boutique property feels more like a friend’s apartment than a hotel, thanks to its spacious, light-filled rooms, shelves of design books and mid-century Danish furniture. Designed by Anders Petersen, one of Denmark’s most notable vintage furniture collectors, Collector’s Suite 570 pays homage to 1970s Denmark style, complete with hessian-covered walls and rya rugs. Copenhagen is the European city with the shortest distance from airport to city centre. Driving by taxi to the City Hall Square takes approximately 20 minutes and costs around 250 to 300 DKK. Public transportation is often cheaper and faster, and is accessible near the airport. The public transport system in Copenhagen is very efficient. Fares are valid for any of its systems – metro, train or bus – in a given time span, and tickets can be purchased from machines at any metro and train station. The metro is the most modern in the world and runs both day and night in the city centre. Create an account with the bike sharing service Bycyklen; then pick up a bike from one of the docking stations throughout the city. The pay-as-you-go option costs 30 DKK per hour; pre-paid packages for 10 or 20 hours are also available. Noma’s not the only show in town. Head north, to the white-hot Nørrebro district, to taste the future of Scandinavian food. Denmark’s rise as one of Europe’s culinary epicentres rests squarely on the shoulders of Noma, a Copenhagen institution famous for intrepid local sourcing, precision cooking, and frequent citations as the world’s best restaurant. But the mecca that helped brand New Nordic cuisine is no longer the only reason to come here. Prominent chefs, including a few Noma veterans, have moved on to open their own kitchens, and have created a second wave in Copenhagen’s foodie revolution. Head to the city’s new centre of gastronomic gravity, the northern neighborhood of Nørrebro. Along its main drag, Jaegersborggade, Denmark’s best young cooks are plating a more playful, scrappy iteration of Scandi cuisine. That explains the low-key whitewashed dining room, where guests can eat at wood-slab tables or at a counter that loops around the open kitchen. The menu changes regularly, but some star dishes include a mousse of chanterelle mushrooms; roasted wild duck roused by elderberries; and a composed plate of pickled mackerel, cauliflower and lemon puree. If Relae is casual, Manfreds, its sister restaurant across the street, is a study in dive-chic. 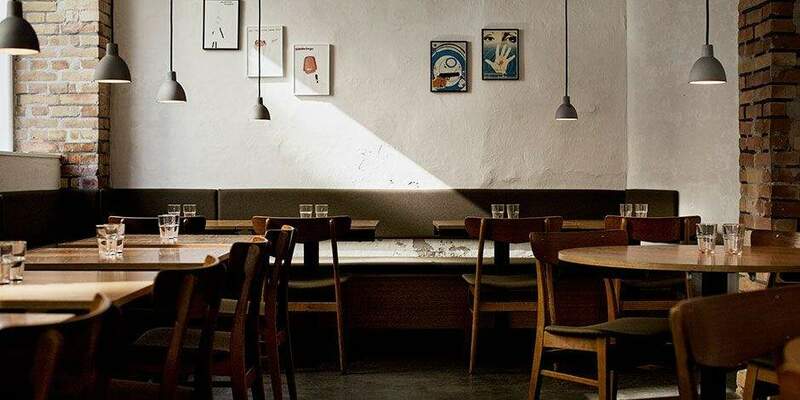 Unadorned tables run along rough, concrete walls to a back bar, which gleams with bottles of naturally fermented wines from France, Spain, and Italy. The sommeliers select three of these to pair with the kitchen’s signature small vegetable-forward dishes. Some of our recent favorites include charred onions with green strawberries and Havgus cheese, and a baked pumpkin crowned with roasted seeds and beurre blanc. If you’re looking for a meatier option, try the pork rillette coupled with rhubarb, which you can slather on sourdough bread for a sublime bite. Luckily, the high-low theme extends to the prices: seven courses go for just 250 krone ($50 Canadian) per person. Wander the blocks east of Manfreds and Relae, and you’ll find a range of innovative bakeries and candy stores that can satisfy any craving. At Karamelleriet, caramels of every kind—from fruit to chocolate-coconut to sweet licorice—are rolled out on a long marble counter and then piled into buckets. Buy a bag to eat on the spot or a jar’s worth to bring home. The handmade chocolates at the dollhouse-sized Ro Chokolade are displayed behind glass like jewels. The real stars here are the hand-rolled multi-colored truffles flavored with chili, star anise and a range of other fun flavours. The lines form early outside the tiny patisserie Meyers Bakery. Half of the hungry crowd is waiting for the crusty breads (Danish rye, barley, sourdough), all baked on the premises, to come out of the oven. The other half is queuing for the signature cinnamon rolls laced with Valhrona chocolate. Picnic tables line Jaegersborggade, so you can hop from hotspot to hotspot—think of it as Nordic fiesta—tasting snacks at each. Start at Terroiristen, at the western end of the street, where you can order a tapas plate of parma ham, tapenade and Danish cheeses, or a hot dish of braised veal cheeks. Nearby, at Antidote Vinebar, the al fresco party continues with the street’s boho crowds munching on stacked sandwiches by day, like a hanger steak and marinated artichoke heart combo, and fresh water prawns tossed with chorizo in the evening. For pizza, take the quick stroll through the nearby Assistens Cemetery to Guldbergsgade. This street may just be Copenhagen’s next culinary it spot, led by Baest. Forgoing the Nordic template, the Nørrebro-goes-Neapolitan trattoria specializes in thin-crust pizzas, like a standout pie topped with broccoli, locally sourced Hindsholm sausage, and sheep’s cheese pie. It’s not traditional Scandinavian cuisine, but it could signal the coming shape of Copenhagen’s hungry evolution.